ZF Friedrichshafen supplies the new-generation Maserati Quattroporte’s eight-speed automatic transmission, which is 4kg lighter than the six-speed transmission used in the car’s predecessor. When combined with a stop-start system, the new gearbox is 11 percent more fuel efficient than the previous unit, a factor that helped Maserati reduce the Quattroporte’s overall fuel consumption and CO2 emissions by 20 percent to 278 grams per kilometer compared with the previous model. In addition, the new transmission has auto adaptive software that recognizes the driver’s style and alters the car’s shifting accordingly. The driver can select from five different shift modes that include the all-new I.C.E (Increased Control & Efficiency) option, which shifts gears as smoothly as possible to optimize fuel economy and improve vehicle stability in extreme low-grip situations. ZF also supplied the Quattroporte’s continuous damping control (CDC) electronic damping system. The system is made up of an electronic control unit, dampers and sensors that monitor parameters including speed, lateral and longitudinal acceleration, individual wheel movements and body movements to adjust the damping forces of each wheel in milliseconds to adapt to changing driving situations and ensure the wheels maintain optimum contact with the road to improve vehicle stability and safety. Brembo provides the Quattroporte’s front and rear brake modules consisting of discs, calipers and hub carriers. Standard models are equipped with one-piece 330mm discs and four-piston calipers up front. Sportier variants get six-piston calipers and larger forged and ventilated 360mm discs, which are constructed using dual-cast technologies to utilize the strength of cast iron with lightweight aluminum. All models feature 330mm discs and four-piston calipers in the back. 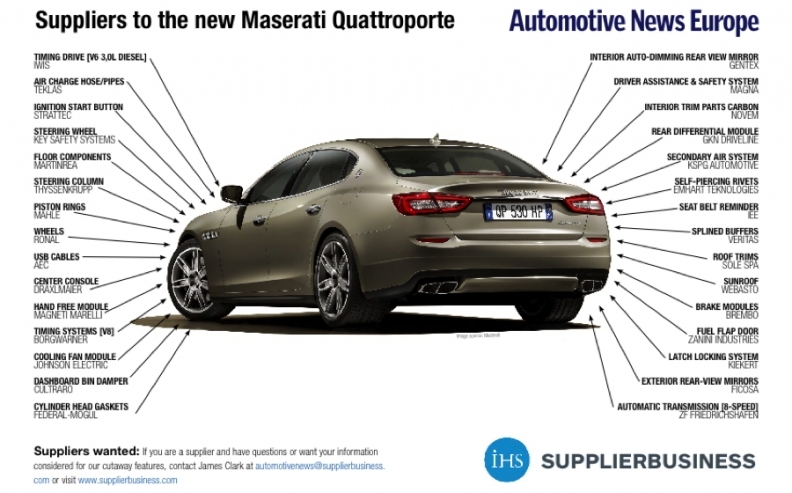 Assembly of the sixth-generation Quattroporte began in January 2013 at Maserati parent Fiat Chrysler Automobiles' factory in Grugliasco, Italy. Quattroporte output will peak at more than 11,000 units this year, according to an IHS Automotive forecast.